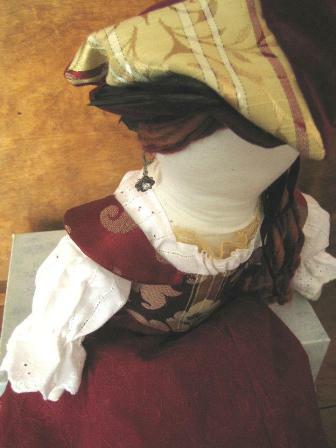 These are the fanciful dolls that follow me on my travels to renaissance faires. Like the goodly folk who walk the lanes of our villages: Lords and Ladies, Queens, Princesses in distress! Scots and Lassies reel to the skirling of pipers! The Rurally inclined. Villagers and Fools. Hobbits and Wizards to slay the dragons! 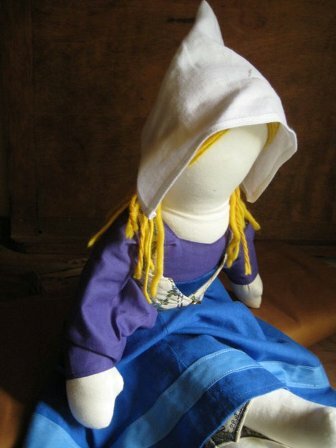 The rhagdolls reflect my love of British Folklore, Mother Goose and the Brothers Grim, also my love of bringing the bedtime stories of my childhood to life. They are the larger cousins of the Moppets. 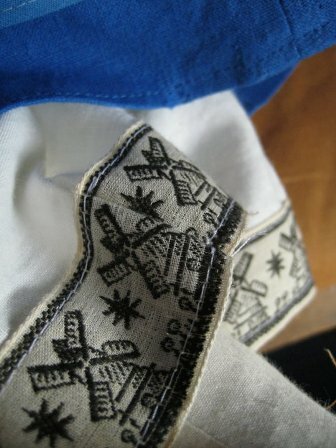 This is where the detail drives me to near insanity! 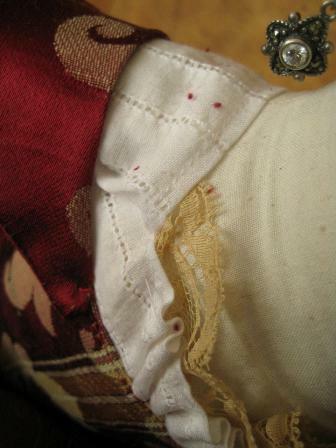 Buttons, silks, trims, feathers, jacquards, moiré, handspun yarns. All Wee Folk are 22" handmade, individual, unique. All dolls are named, signed and dated. 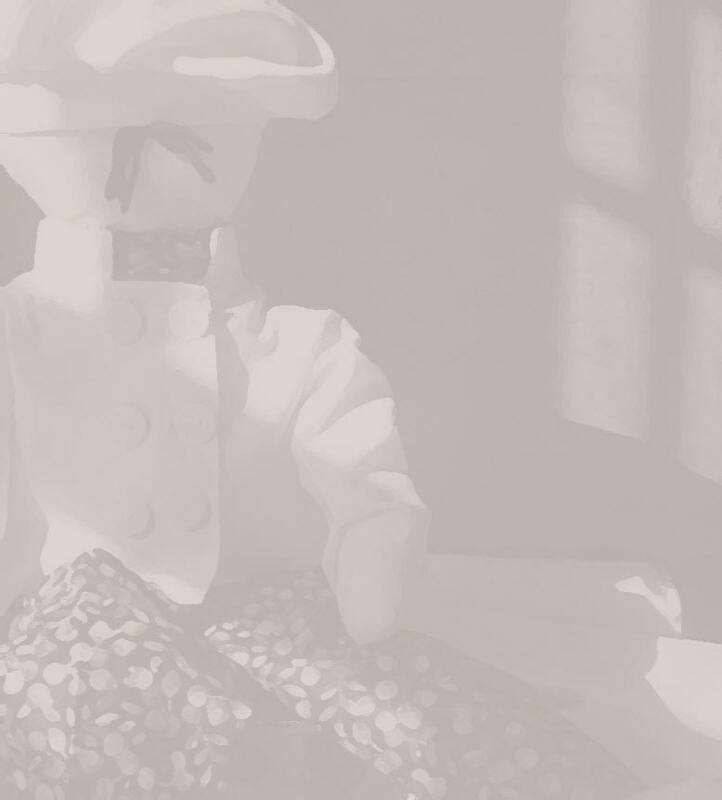 I write a story about each doll: what inspired me to make it or what I saw when it was complete. Interested in a doll seen here? Have an idea for your own special rhagdoll? Want more info? Click here to email Trese or see us on Facebook! 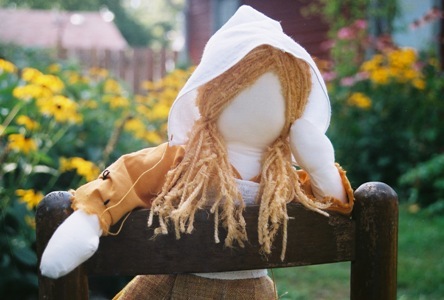 Sometimes I find inspiration for dolls in the oddest places and the simplest things. ...what if they were pirates not guests on a pleasure cruise? Mary Ann was my castaway favorite, I had to make her my piratical alter ego. red is my favorite color. 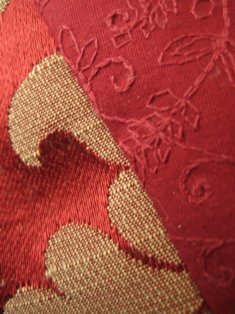 a swatch of red and gold Jacquard, a scrap of red velvet, hand crocheted lace. she needed a a statement piece: the hat! I stood on a stone beach,the Orkneys across the storming North Sea.There was Brown’s story of the Selkie. She needed a brown coat, linen, a seal’s coat. 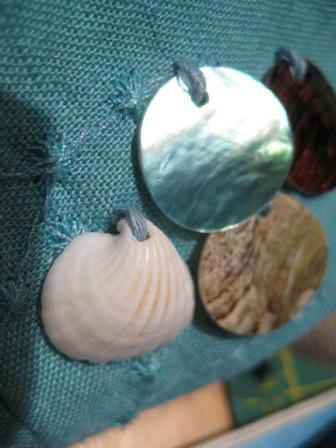 Whorl embroidered fabric the color of the sea. Shells clinging to her hem in the colors of sky and sand. starts an old jumping rope rhyme. so I dressed her in blue and found a great Dutch name! She was just seven years old when her mother, Bakwa Turunku, become queen. Amina learned fairness and justice early and well. Queen Amina brought prosperity and peace came to Zaria earning great admiration from her people. My grandmother lived in Liberia when I was a child. she brought back wonderful fabrics. 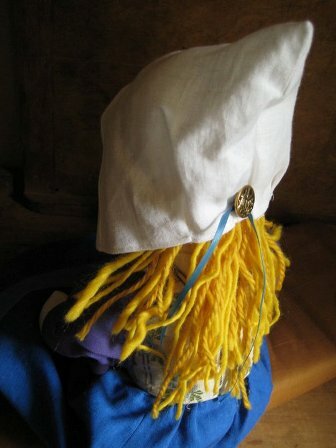 I found this scrap of hand woven in her sewing box, and around it I built this doll. embroidery at the hem to repeat the colors... black and gold belt for royalty... seed bead for the Maasi tribe... once she was done I went in search of a true queen of Africa. In fable, tale and rhyme he is both a trickster and the teller of truths. Old Man Crow is yet one more of his names. Black silk for the crow. deep purple for the shine of the wing caught in sunlight. long iridescent feathers for his tail, ostrich pin feathers for the air. silver buttons, different, and many. If you'd like more images of Fanciful Wee Folks, contact Trese, or visit the Facebook page.